When men own a number of different hand tools, nails, bolts, nuts and other elements for DIY or construction tasks, it is imperative that they also turn to the right storage boxes to place these items in between uses to keep them in ideal condition. On top of this, an ideal option is when the boxes also contain different compartments or inserts to help the men organise these elements. Exactapak and Multi 10 storage boxes are the tool man’s best friends on all of the above counts and more. Explore the benefits of these boxes in our following informative details. 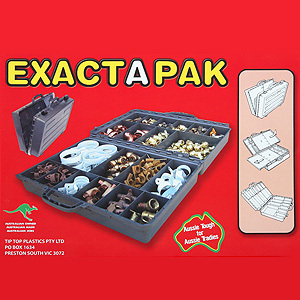 Multi 10 and Exactapak storage boxes are made here in Australia. As a result, when you rely on them for your tool and accessory storage, you will be supporting a local industry instead of one that is overseas. The double sided feature of the boxes ensures that the body can stand up to daily use. On top of this, their acrylonitrile butadiene styrene or ABS construction enhances the toughness of these boxes by making them impact resistant. After all, ABS has a higher durability than pure polystyrene. To help you locate your elements in a quick manner, there is a clear internal lid that shows all the contents or the first layer of contents depending upon whether you own the Exactapak or Multi 10 storage boxes. You also will see that these lids keep the contents in place during transport. Each style of these storage boxes provides separate compartments where you can separate your tools and accessories to keep things in an organised fashion. This feature is especially useful for such elements as screws, nails, bolts, washers and nuts. Multi 10 storage boxes contain removable inserts to offer you flexible options on how you arrange the interior of them. You also receive a double layer of storage in certain areas of the boxes. As you require the elements inside these boxes, you can lift out the romovable sections if necessary to access them. For further details or to order Exactapak and Multi 10 storage boxes, contact Tip Top Plastics or browse through our website. We are the proud owners and manufacturers of both types of boxes. They are the original and the best of their product category. Our company guarantees your satisfaction.